Disclosure: Thanks to The Carlyle Dupont circle for hosting me and my friends and also making this post possible. Thanks to Armand Hugon for the pictures. Raise your hands if you like a midweek hotel therapy?? Well, I do and I am all jumpy with joy. Last week I had the pleasure of hosting my very own, very first progressive brunch in collaboration with THE CARLYLE DC and my blogger besties Patricia and Marisol. Not exactly a progressive brunch, but one with a twist, wherein instead of eating different courses at the different participants in succession, we enjoyed different courses at different spots of the hotel, rather different nooks of our room. So what exactly is a "progressive brunch ??" It is a social occasion at which the different courses of a meal are eaten at different people's houses. It is an effective way to socialize and shoulder the burden and cost of hosting by one person. So, the cost and effort gets divided amongst the different hosts. I am really thankful to the team at The Carlyle DC for making my very first progressive brunch possible. 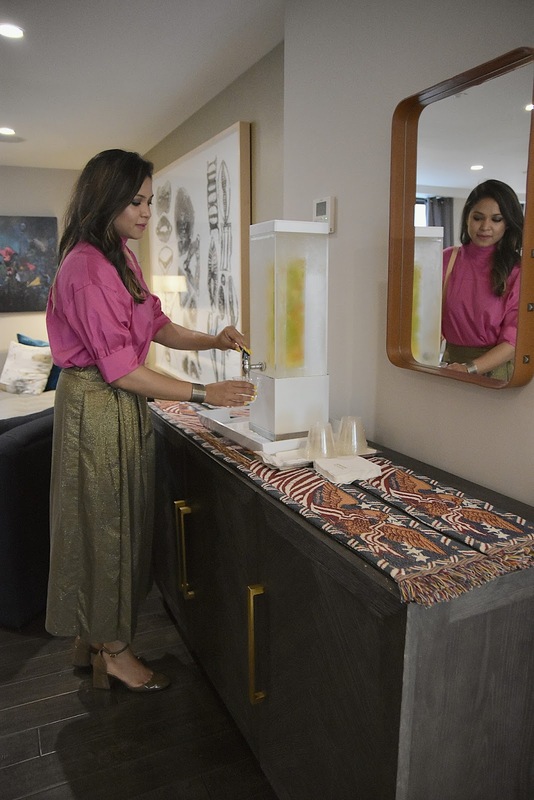 ABOUT: Located in the heart of Dupont Circle, The Carlyle takes pride in it's world class style aesthetics and customer relations. 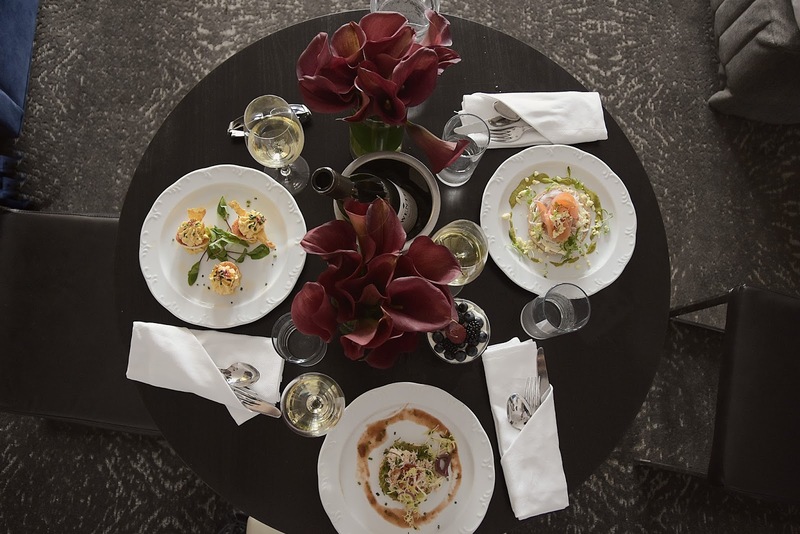 House to the famous restaurant The Riggsby by the Boston renowned chef Michael Schlow, The Carlyle lives up to the guests expectations of enjoying lodging, food, fitness and spa: all under one roof. 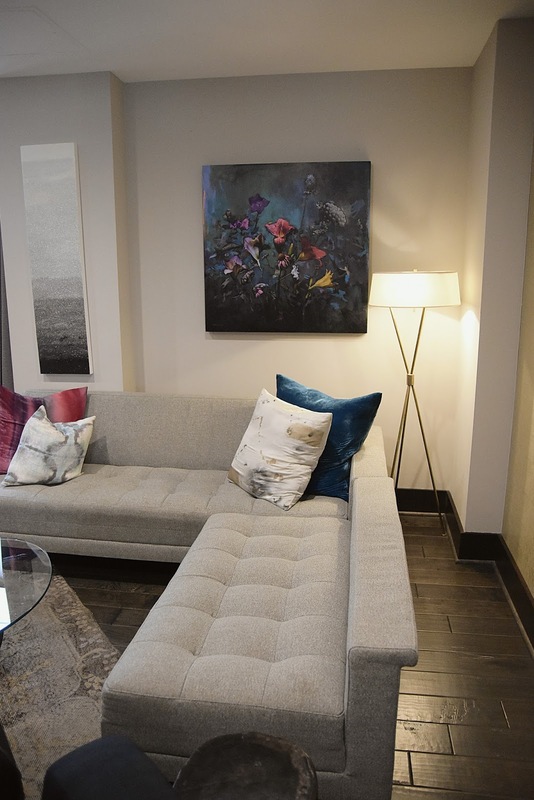 With a myriad of art work and paintings that one will witness across the hotel, The Carlyle is famous for it's rotating art. 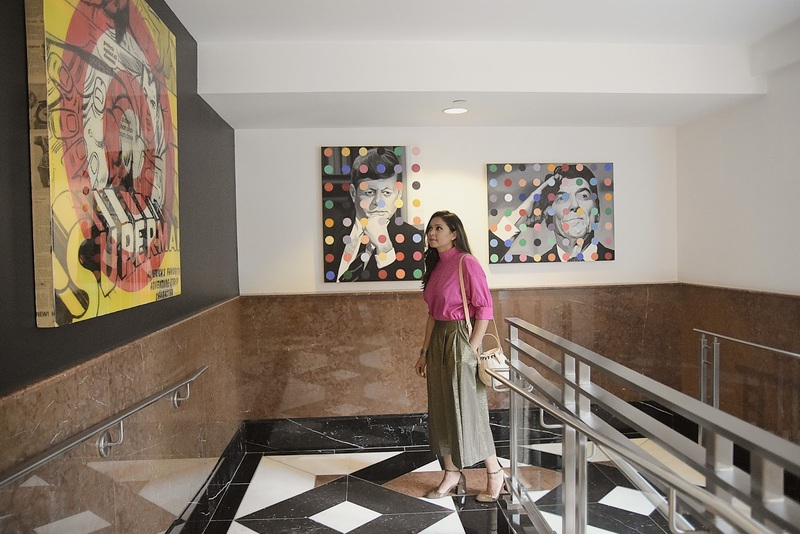 With so much art on display, the hotel is like a museum hotel, worth witnessing. 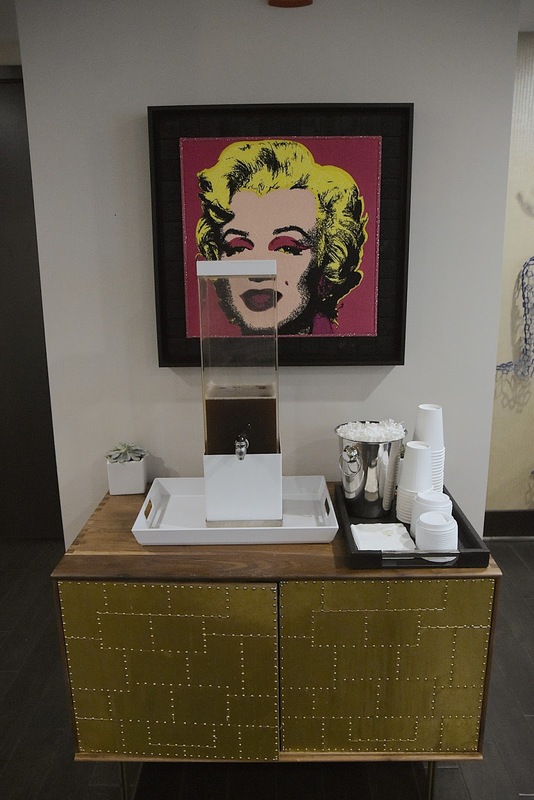 Our progressive brunch began with the 'welcome drink by the lounge.' My guests could cool off either to some lemon orange water or flavored iced teas. The style and color aesthetics of the lobby was really impressive. 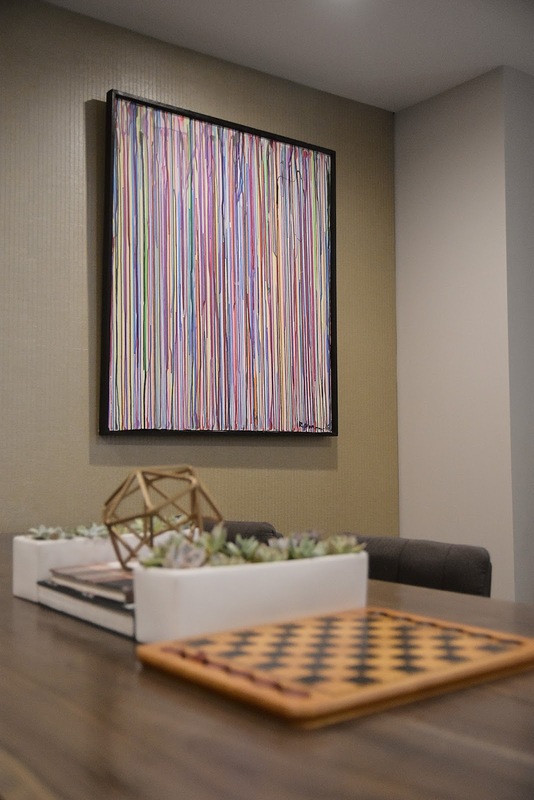 For a person who loves bright hues, this lobby was the epitome of a perfect balance of colors and lighting. Catch up some news in their business center or try a round of chess, there is no dearth of activities for you and your family, while you wait to check-in. We then checked into our room. With a view of the Monument and ample natural light coming through the window, it was the ideal set up for a great brunch tete-a-tete. There were two queen size beds, a kitchenette with coffee-maker, a full bar, huge his and her closets, bathrobes, yoga mat, blow dryer and every essential you would need for that at-home feeling. Our next course was 'Wine by the cozy bed.' Who doesn't love some chilled wine on a hot-hot day?? Also, when you have good company, wine is a must. Okay, now talk to me about our next course! Well, not exactly a meal course, but a sweet treat : spa service in our own room. We all were treated to a quick round of message, all in the comfort of our own room. This was the best course indeed- just kidding ! After the in-room message service, we changed and continued our hotel tour. While we toured around the hotel, the restaurant staff from The Riggsby, laid out this scrumptious brunch spread by the dinette. With items off their special brunch menu, there was deviled eggs, bagel with lox and salmon toast. Thanks to Patty and Marisol for sharing their dishes with me. You can tell that from this crazy picture of us. The next course was Parfait by the bed. This summer perfect chilled parfait was just what we could have asked for on that girl's afternoon in. It was sweet and crunchy and nutty too-whomp whomp ! Last but not the least was a "coffee date with self". Perfect ending to any meal, some hot latte followed with some lone TV time and a power nap. Soon after the coffee, my friends left and I stayed back to watch my favorite TV shows, which otherwise never happens with my daughter and hubby around. I really couldn't have asked for more. An afternoon of food, fun and friends, a perfect midweek pick-me-up. 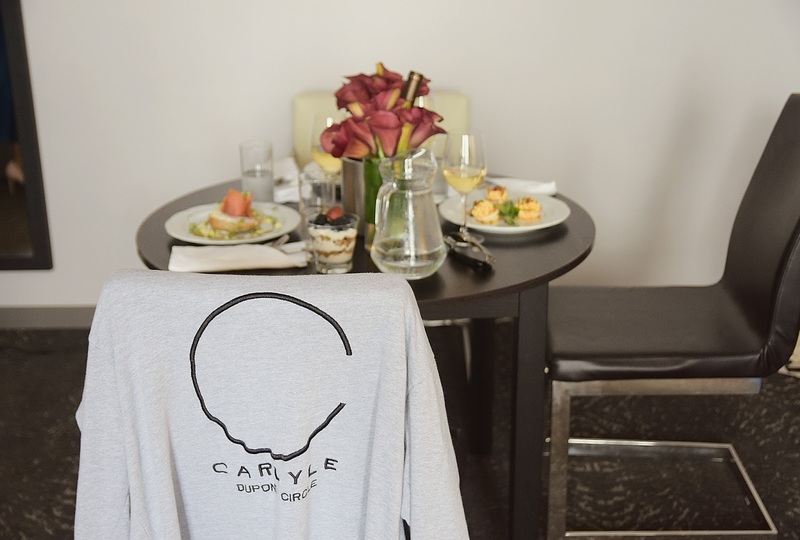 Thanks to The Carlyle DC was having us and helping me make this progressive brunch a possibility and a success too.